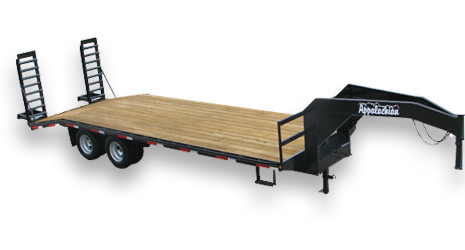 Our premium grade 10 ton flatbed tandem dual gooseneck trailers are built with a heavy duty 12″ I-Beam main frame, 6″ channel outer rails, and close 16″ crossmember spacing. The oil bath, tandem dual axles, with premium tires provide a long lasting running gear. Loading equipment is easy on the cleated swing-up loading ramps. Other valuable features include a long-lasting treated wood floor and a toolbox with a lockable lid. There is no need to worry about lighting issues down the road. This trailer has a one-piece, US made, sealed modular wiring harness and lifetime rubber mounted LED lighting. These Tandem Dual Gooseneck Trailers are available in 5′ increments from 25′ to 40′ long. GVWR 25,000 lb. - Capacity 20,000 lb. with 5,000 lb. Hitchload Ramp Capacity 20,000 lb. 12″ I-Beam main frame @ 19PPF on 35′ and 40′ models – includes torque tube.